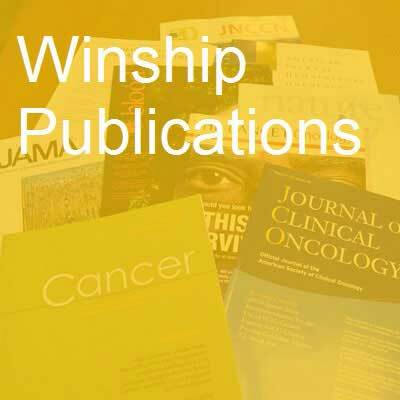 Various first authors and senior authors from Winship Cancer Institute have published 84 studies in major medical and scientific journals in the past month. Is C-reactive protein ready for prime time in the selection of antidepressant medications? Miller AH, Trivedi MH, Jha MK. Psychoneuroendocrinology. 2017; 84:206. PubMed PMID: 28449941. Association Between Interleukin-6 and Striatal Prediction-Error Signals Following Acute Stress in Healthy Female Participants. Treadway MT, Admon R, Arulpragasam AR, Mehta M, Douglas S, Vitaliano G, Olson DP, Cooper JA, Pizzagalli DA. Biological psychiatry. 2017; 82(8):570-577. PubMed PMID: 28506437; PubMed Central PMCID: PMC5610086. Activation of tumor suppressor LKB1 by honokiol abrogates cancer stem-like phenotype in breast cancer via inhibition of oncogenic Stat3. Sengupta S, Nagalingam A, Muniraj N, Bonner MY, Mistriotis P, Afthinos A, Kuppusamy P, Lanoue D, Cho S, Korangath P, Shriver M, Begum A, Merino VF, Huang CY, Arbiser JL, Matsui W, Győrffy B, Konstantopoulos K, Sukumar S, Marignani PA, Saxena NK, Sharma D. Oncogene. 2017; 36(41):5709-5721. PubMed PMID: 28581518. Recent Patterns in Genetic Testing for Breast and Ovarian Cancer Risk in the U.S. Han X, Jemal A. American journal of preventive medicine. 2017; 53(4):504-507. PubMed PMID: 28669566. A Single Exposure to Low- or High-LET Radiation Induces Persistent Genomic Damage in Mouse Epithelial Cells In Vitro and in Lung Tissue. Werner E, Wang Y, Doetsch PW. Radiation research. 2017; 188(4):373-380. PubMed PMID: 28753066. Associations of Coffee Drinking and Cancer Mortality in the Cancer Prevention Study-II. Gapstur SM, Anderson RL, Campbell PT, Jacobs EJ, Hartman TJ, Hildebrand JS, Wang Y, McCullough ML. Cancer epidemiology, biomarkers & prevention : a publication of the American Association for Cancer Research, cosponsored by the American Society of Preventive Oncology. 2017; 26(10):1477-1486. PubMed PMID: 28751477. What are the gaps in quality measurement for lung cancer surgery? Fernandez FG. The Journal of thoracic and cardiovascular surgery. 2017; 154(4):1395-1396. PubMed PMID: 28754508. On assessing the effect of breast cancer screening schemes. Brawley OW. Cancer. 2017; 123(19):3656-3659. PubMed PMID: 28832972. A pattern-based risk-stratification scheme for salivary gland cytology: A multi-institutional, interobserver variability study to determine applicability. Griffith CC, Schmitt AC, Pantanowitz L, Monaco SE. Cancer. 2017; 125(10):776-785. PubMed PMID: 28834233; PubMed Central PMCID: PMC5647230. Dedifferentiated chondrosarcoma of the larynx: Radiological, gross, microscopic and clinical features. Magliocca KR, Edgar MA, Corey A, Villari CR. Annals of diagnostic pathology. 2017; 30:42-46. PubMed PMID: 28965627. Racial and ethnic disparities in smoking prevalence in Israel and the United States: progress to date and prospects for the future. Blumenthal DS. Israel journal of health policy research. 2017; 6(1):51. PubMed PMID: 28969689; PubMed Central PMCID: PMC5625817. LEF-1: Diagnostic utility in distinguishing basaloid neoplasms of the salivary gland. Schmitt AC, Griffith CC, Cohen C, Siddiqui MT. Diagnostic cytopathology. 2017; PubMed PMID: 28972308. California dreaming. Khuri FR. Cancer. 2017; PubMed PMID: 28976539. SPIRIT trial: A phase III pragmatic trial of an advance care planning intervention in ESRD. Song MK, Unruh ML, Manatunga A, Plantinga LC, Lea J, Jhamb M, Kshirsagar AV, Ward SE. Contemporary clinical trials. 2017; PubMed PMID: 28993286. Correspondence between results and aims of funding support in EPIDEMIOLOGY papers. Lash TL, Kaufman JS, Hernán MA. Epidemiology (Cambridge, Mass.). 2017; PubMed PMID: 29023240. Head and Neck: Skull Base Imaging. Hudgins PA, Baugnon KL. Neurosurgery. 2017; PubMed PMID: 29040722. Functions of actin-interacting protein 1 (AIP1)/WD repeat protein 1 (WDR1) in actin filament dynamics and cytoskeletal regulation. Ono S. Biochemical and biophysical research communications. 2017; PubMed PMID: 29056508. New designs for new epidemiology. Lash TL, Schisterman EF. Epidemiology (Cambridge, Mass.). 2017; PubMed PMID: 29068839. TP53 mutations in MCL: more therapy is not better. Cohen JB. Blood. 2017; 130(17):1876-1877. PubMed PMID: 29074593. The P-mJOA: A Patient-derived, Self-reported Outcome Instrument for Evaluating Cervical Myelopathy: Comparison with the mJOA. Rhee JM, Shi WJ, Cyriac M, Kim JY, Zhou F, Easley KA, Patel A. Clinical spine surgery. 2017; PubMed PMID: 29088009. Ipilimumab and Stereotactic Radiosurgery Versus Stereotactic Radiosurgery Alone for Newly Diagnosed Melanoma Brain Metastases. Patel KR, Shoukat S, Oliver DE, Chowdhary M, Rizzo M, Lawson DH, Khosa F, Liu Y, Khan MK. American journal of clinical oncology. 2017; 40(5):444-450. PubMed PMID: 26017484. Changes in thyroid cancer incidence, post-2009 American Thyroid Association guidelines. Shi LL, DeSantis C, Jemal A, Chen AY. The Laryngoscope. 2017; 127(10):2437-2441. PubMed PMID: 28092116. Stem cell transplantation therapy for multifaceted therapeutic benefits after stroke. Wei L, Wei ZZ, Jiang MQ, Mohamad O, Yu SP. Progress in neurobiology. 2017; 157:49-78. PubMed PMID: 28322920; PubMed Central PMCID: PMC5603356. A random walk-based segmentation framework for 3D ultrasound images of the prostate. Ma L, Guo R, Tian Z, Fei B. Medical physics. 2017; 44(10):5128-5142. PubMed PMID: 28582803; PubMed Central PMCID: PMC5646238. Next-generation sequencing and clinical outcomes of patients with lung adenocarcinoma treated with stereotactic body radiotherapy. Cassidy RJ, Zhang X, Patel PR, Shelton JW, Escott CE, Sica GL, Rossi MR, Hill CE, Steuer CE, Pillai RN, Ramalingam SS, Owonikoko TK, Behera M, Force SD, Fernandez FG, Curran WJ, Higgins KA. Cancer. 2017; 123(19):3681-3690. PubMed PMID: 28608966. OncoPPi-informed discovery of mitogen-activated protein kinase kinase 3 as a novel binding partner of c-Myc. Ivanov AA, Gonzalez-Pecchi V, Khuri LF, Niu Q, Wang Y, Xu Y, Bai Y, Mo X, Prochownik EV, Johns MA, Du Y, Khuri FR, Fu H. Oncogene. 2017; 36(42):5852-5860. PubMed PMID: 28628118; PubMed Central PMCID: PMC5648601. A Small-Molecule Inhibitor of WEE1, AZD1775, Synergizes with Olaparib by Impairing Homologous Recombination and Enhancing DNA Damage and Apoptosis in Acute Leukemia. Garcia TB, Snedeker JC, Baturin D, Gardner L, Fosmire SP, Zhou C, Jordan CT, Venkataraman S, Vibhakar R, Porter CC. Molecular cancer therapeutics. 2017; 16(10):2058-2068. PubMed PMID: 28655785; PubMed Central PMCID: PMC5628125. Maternal exposure to selenium and cadmium, fetal growth, and placental expression of steroidogenic and apoptotic genes. Everson TM, Kappil M, Hao K, Jackson BP, Punshon T, Karagas MR, Chen J, Marsit CJ. Environmental research. 2017; 158:233-244. PubMed PMID: 28662449; PubMed Central PMCID: PMC5554457. The RNA-binding protein, ZC3H14, is required for proper poly(A) tail length control, expression of synaptic proteins, and brain function in mice. Rha J, Jones SK, Fidler J, Banerjee A, Leung SW, Morris KJ, Wong JC, Inglis GAS, Shapiro L, Deng Q, Cutler AA, Hanif AM, Pardue MT, Schaffer A, Seyfried NT, Moberg KH, Bassell GJ, Escayg A, García PS, Corbett AH. Human molecular genetics. 2017; 26(19):3663-3681. PubMed PMID: 28666327. Simulators for Laryngeal and Airway Surgery. Burns JA, Adkins LK, Dailey S, Klein AM. Otolaryngologic clinics of North America. 2017; 50(5):903-922. PubMed PMID: 28669461. Dual-Phase Transmit Focusing for Multiangle Compound Shear-Wave Elasticity Imaging. Yoon H, Aglyamov SR, Emelianov SY. IEEE transactions on ultrasonics, ferroelectrics, and frequency control. 2017; 64(10):1439-1449. PubMed PMID: 28708552. Microfluidic Transduction Harnesses Mass Transport Principles to Enhance Gene Transfer Efficiency. Tran R, Myers DR, Denning G, Shields JE, Lytle AM, Alrowais H, Qiu Y, Sakurai Y, Li WC, Brand O, Le Doux JM, Spencer HT, Doering CB, Lam WA. Molecular therapy : the journal of the American Society of Gene Therapy. 2017; 25(10):2372-2382. PubMed PMID: 28780274; PubMed Central PMCID: PMC5628863. Development of GLUT4-selective antagonists for multiple myeloma therapy. Wei C, Bajpai R, Sharma H, Heitmeier M, Jain AD, Matulis SM, Nooka AK, Mishra RK, Hruz PW, Schiltz GE, Shanmugam M. European journal of medicinal chemistry. 2017; 139:573-586. PubMed PMID: 28837922; PubMed Central PMCID: PMC5603412. Generation of Clickable Pittsburgh Compound B for the Detection and Capture of β-Amyloid in Alzheimer's Disease Brain. Diner I, Dooyema J, Gearing M, Walker LC, Seyfried NT. Bioconjugate chemistry. 2017; 28(10):2627-2637. PubMed PMID: 28862836. Synthesis and C-H Functionalization Chemistry of Thiazole-Semicoronenediimides (TsCDIs) and -Coronenediimides (TCDIs). Shi Q, Andreansky ES, Marder SR, Blakey SB. The Journal of organic chemistry. 2017; 82(19):10139-10148. PubMed PMID: 28885844. Comparison of a physical activity recall questionnaire with accelerometry in children and adolescents with obesity: a pilot study. Lockwood J, Jeffery A, Schwartz A, Manlhiot C, Schneiderman JE, McCrindle BW, Hamilton J. Pediatric obesity. 2017; 12(5):e41-e45. PubMed PMID: 27654825. Rhodium- and Non-Metal-Catalyzed Approaches for the Conversion of Isoxazol-5-ones to 2,3-Dihydro-6H-1,3-oxazin-6-ones. Jurberg ID, Davies HML. Organic letters. 2017; 19(19):5158-5161. PubMed PMID: 28892631. Regioselective Intermolecular Allylic C-H Amination of Disubstituted Olefins via Rhodium/π-Allyl Intermediates. Burman JS, Blakey SB. Angewandte Chemie (International ed. in English). 2017; 56(44):13666-13669. PubMed PMID: 28913956. Medication nonadherence in dermatology: Divergent ethical implications for patient care. Plost GR, Stoff BK. Journal of the American Academy of Dermatology. 2017; 77(4):787-789. PubMed PMID: 28917470. TrkB neurotrophic activities are blocked by α-synuclein, triggering dopaminergic cell death in Parkinson's disease. Kang SS, Zhang Z, Liu X, Manfredsson FP, Benskey MJ, Cao X, Xu J, Sun YE, Ye K. Proceedings of the National Academy of Sciences of the United States of America. 2017; 114(40):10773-10778. PubMed PMID: 28923922; PubMed Central PMCID: PMC5635931. Copper Sulfide Perfluorocarbon Nanodroplets as Clinically Relevant Photoacoustic/Ultrasound Imaging Agents. Santiesteban DY, Dumani DS, Profili D, Emelianov SY. Nano letters. 2017; 17(10):5984-5989. PubMed PMID: 28926263. Advancing the Science of Qualitative Research to Promote Health Equity. Griffith DM, Shelton RC, Kegler M. Health education & behavior : the official publication of the Society for Public Health Education. 2017; 44(5):673-676. PubMed PMID: 28927354. The Promise of Qualitative Research to Inform Theory to Address Health Equity. Shelton RC, Griffith DM, Kegler MC. Health education & behavior : the official publication of the Society for Public Health Education. 2017; 44(5):815-819. PubMed PMID: 28927355. Reply. Peragallo JH, Dattilo M, Bruce BB. Ophthalmology. 2017; 124(10):e76-e77. PubMed PMID: 28938933. Structurally Ordered Nanowire Formation from Co-Assembly of DNA Origami and Collagen-Mimetic Peptides. Jiang T, Meyer TA, Modlin C, Zuo X, Conticello VP, Ke Y. Journal of the American Chemical Society. 2017; 139(40):14025-14028. PubMed PMID: 28949522. A Phase 1 study of ARQ 087, an oral pan-FGFR inhibitor in patients with advanced solid tumours. Papadopoulos KP, El-Rayes BF, Tolcher AW, Patnaik A, Rasco DW, Harvey RD, LoRusso PM, Sachdev JC, Abbadessa G, Savage RE, Hall T, Schwartz B, Wang Y, Kazakin J, Shaib WL. British journal of cancer. 2017; PubMed PMID: 28972963. Nuclear poly(A) binding protein 1 (PABPN1) and Matrin3 interact in muscle cells and regulate RNA processing. Banerjee A, Vest KE, Pavlath GK, Corbett AH. Nucleic acids research. 2017; 45(18):10706-10725. PubMed PMID: 28977530. Clinical Implications of Single-Cell Microfluidic Devices for Hematological Disorders. Hansen CE, Lam WA. Analytical chemistry. 2017; PubMed PMID: 28942646. Impact of extracellular fluid tonicity on sickle red blood cell deformability and adhesion. Carden MA, Fay ME, Lu X, Mannino RG, Sakurai Y, Ciciliano JC, Hansen CE, Chonat S, Joiner CH, Wood DK, Lam WA. Blood. 2017; PubMed PMID: 28978568. Optimization of data acquisition in axial CT under the framework of sampling on lattice for suppression of aliasing artifacts with algorithmic detector interlacing. Xie H, Tang X. Medical physics. 2017; PubMed PMID: 28986917. Towards remote assessment and screening of acute abdominal pain using only a smartphone with native accelerometers. Myers DR, Weiss A, Rollins MR, Lam WA. Scientific reports. 2017; 7(1):12750. PubMed PMID: 28986551; PubMed Central PMCID: PMC5630621. LSD1 protects against hippocampal and cortical neurodegeneration. Christopher MA, Myrick DA, Barwick BG, Engstrom AK, Porter-Stransky KA, Boss JM, Weinshenker D, Levey AI, Katz DJ. Nature communications. 2017; 8(1):805. PubMed PMID: 28993646; PubMed Central PMCID: PMC5634471. Ethical Challenges with Treating Non-Adherent Patients in a Group Practice Setting. Freemyer B, Stoff B. Journal of the American Academy of Dermatology. 2017; PubMed PMID: 29037994. Neuroepigenetic mechanisms in disease. Christopher MA, Kyle SM, Katz DJ. Epigenetics & chromatin. 2017; 10(1):47. PubMed PMID: 29037228; PubMed Central PMCID: PMC5644115. Implications of Attrition in a Longitudinal Web-Based Survey: An Examination of College Students Participating in a Tobacco Use Study. McDonald B, Haardoerfer R, Windle M, Goodman M, Berg C. JMIR public health and surveillance. 2017; 3(4):e73. PubMed PMID: 29038092. Landmarks for the preservation of the middle temporal artery during mastoid surgery: Cadaveric dissection study. Daraei P, Mattox DE. American journal of otolaryngology. 2017; PubMed PMID: 29037583. Massage therapy decreases cancer-related fatigue: Results from a randomized early phase trial. Kinkead B, Schettler PJ, Larson ER, Carroll D, Sharenko M, Nettles J, Edwards SA, Miller AH, Torres MA, Dunlop BW, Rakofsky JJ, Rapaport MH. Cancer. 2017; PubMed PMID: 29044466. Probing blood cell mechanics of hematologic processes at the single micron level. Ciciliano JC, Abbaspour R, Woodall J, Wu C, Bakir MS, Lam WA. Lab on a chip. 2017; PubMed PMID: 29052682. Implementing an Evidence-based Tobacco Control Program at Five 2-1-1 Call Centers: An Evaluation Using the Consolidated Framework for Implementation Research. Thompson T, Kreuter MW, Caito N, Williams RS, Escoffery C, Fernandez ME, Kegler MC. Nicotine & tobacco research : official journal of the Society for Research on Nicotine and Tobacco. 2017; PubMed PMID: 29059356. Walking in Relation to Mortality in a Large Prospective Cohort of Older U.S. Adults. Patel AV, Hildebrand JS, Leach CR, Campbell PT, Doyle C, Shuval K, Wang Y, Gapstur SM. American journal of preventive medicine. 2017; PubMed PMID: 29056372. Transplantation Versus Resection for Hilar Cholangiocarcinoma: An Argument for Shifting Treatment Paradigms for Resectable Disease. Ethun CG, Lopez-Aguiar AG, Anderson DJ, Adams AB, Fields RC, Doyle MB, Chapman WC, Krasnick BA, Weber SM, Mezrich JD, Salem A, Pawlik TM, Poultsides G, Tran TB, Idrees K, Isom CA, Martin RCG, Scoggins CR, Shen P, Mogal HD, Schmidt C, Beal E, Hatzaras I, Shenoy R, Cardona K, Maithel SK. Annals of surgery. 2017; PubMed PMID: 29064885.
xMWAS: a data-driven integration and differential network analysis tool. Uppal K, Ma C, Go YM, Jones DP. Bioinformatics (Oxford, England). 2017; PubMed PMID: 29069296. Exploring the potential cost-effectiveness of precision medicine treatment strategies for diffuse large B-cell lymphoma. Chen Q, Staton AD, Ayer T, Goldstein DA, Koff JL, Flowers CR. Leukemia & lymphoma. 2017; :1-10. PubMed PMID: 29065744. DNA N6-methyladenine is dynamically regulated in the mouse brain following environmental stress. Yao B, Cheng Y, Wang Z, Li Y, Chen L, Huang L, Zhang W, Chen D, Wu H, Tang B, Jin P. Nature communications. 2017; 8(1):1122. PubMed PMID: 29066820; PubMed Central PMCID: PMC5654764. Systemic Delivery of siRNA by DNA Nanoparticles Targeting Bcl2 in Cancer Cell Growth. Rahman MA, Wang P, Zhao Z, Wang D, Nannapaneni S, Zhang C, Chen Z, Griffith CC, Hurwitz SJ, Chen ZG, Ke Y, Shin DM. Angewandte Chemie (International ed. in English). 2017; PubMed PMID: 29076273. A Novel Application of Structural Equation Modeling Estimates the Association between Oxidative Stress and Colorectal Adenoma. Eldridge RC, Goodman M, Bostick RM, Fedirko V, Gross M, Thyagarajan B, Flanders WD. Cancer prevention research (Philadelphia, Pa.). 2017; PubMed PMID: 29074536. Optimization of dual-wavelength intravascular photoacoustic imaging of atherosclerotic plaques using Monte Carlo optical modeling. Dana N, Sowers T, Karpiouk A, Vanderlaan D, Emelianov S. Journal of biomedical optics. 2017; 22(10):1-12. PubMed PMID: 29076309. Redefining the Ki-67 Index Stratification for Low-Grade Pancreatic Neuroendocrine Tumors: Improving Its Prognostic Value for Recurrence of Disease. Lopez-Aguiar AG, Ethun CG, Postlewait LM, Zhelnin K, Krasinskas A, El-Rayes BF, Russell MC, Sarmiento JM, Kooby DA, Staley CA, Maithel SK, Cardona K. Annals of surgical oncology. 2017; PubMed PMID: 29079920. Using DIVAN to assess disease/trait-associated single nucleotide variants in genome-wide scale. Chen L, Qin ZS. BMC research notes. 2017; 10(1):530. PubMed PMID: 29084591. Nano-Hydroxyapatite Stimulation of Gene Expression Requires Fgf Receptor, Phosphate Transporter, and Erk1/2 Signaling. Ha SW, Park J, Habib MM, Beck Jr GR. ACS applied materials & interfaces. 2017; PubMed PMID: 29045789. Synthesis of the ABC Substructure of Brevenal by Sequential exo-Mode Oxacyclizations of Acyclic Polyene Precursors. Hurtak JA, McDonald FE. Organic letters. 2017; PubMed PMID: 29083918. Management of Breast Cancer Therapy-Related Sexual Dysfunction. Taylor CE, Meisel JL. Oncology (Williston Park, N.Y.). 2017; 31(10):726-9. PubMed PMID: 29083465. Regulation of ASK1 signaling by scaffold and adaptor proteins. Rusnak L, Fu H. Advances in biological regulation. 2017; PubMed PMID: 29102394. Ultrasound Imaging Technologies for Breast Cancer Detection and Management: A Review. Guo R, Lu G, Qin B, Fei B. Ultrasound in medicine & biology. 2017; PubMed PMID: 29107353. Dual-targeting Wnt and uPA receptors using peptide conjugated ultra-small nanoparticle drug carriers inhibited cancer stem-cell phenotype in chemo-resistant breast cancer. Miller-Kleinhenz J, Guo X, Qian W, Zhou H, Bozeman EN, Zhu L, Ji X, Wang YA, Styblo T, O'Regan R, Mao H, Yang L. Biomaterials. 2017; 152:47-62. PubMed PMID: 29107218.